Reog is one of the arts culture which came from east java province, parts of northwest and ponorogo considered as the true of reog city. City gate ponorogo decorated by warok figure and gemblak, two figures which appeared at the time reog performed. Reog is one of the cultural areas in indonesia that is still very strong used of mistics. There are some versions of the popular strories that develop in the community about the origin of reog and warok, but one of the most famous stories is the story of the rebellion of Ki Ageng Kutu,a man of the kingdom at the time of the last raja majapahit Bhre kertabumi, who ruled in the 15th century. 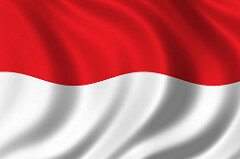 Ki Ageng kutu wrath will be a strong influence from the wife of the king of majapahit who originated from china, in addition to its wrath in corruptions government, he saw that the powers of the majapahit empire will end. He then left the king and founded the college where he taught martial arts to young kids will be the seeds of revival of the majapahit kingdom back. Aware that his army was too small to fight the forces of the kingdom of political messages of Ki Ageng Kutu reog performances delivered by, which is “satire” to the king and his kingdom Bhre Kertabhumi.reog performances become a way of ki ageng kutu build up resistance of local communities using the popularity of reog. Reog performances shown in the mask’s head of lion(singo) known as”the Singo Barong”, the king of forest, which became the symbol for kertabhumi and above, plugged the peacock feathers to resemble a giant fan that symbolises the strong influence of the his queen that peers over all power. Jatilan, played by a group of dancers a gemblak steed-kudaan(horse) became a symbol of the strength of the majapahit army who became the comparison contrast with the power of the warok, which is behind the mask of the red clown of a symbol of Ki Ageng Kutu, alone and sustain weight singo barong mask that reaches more than 50 kg using only his teeth. The popularity of reog Ki Ageng Kutu eventually causes Bhre Kertabhumi taken action and attacked martial art college, a revolt by warok quickly overcome, and forbidden to continue teaching will warok. But the disciples of ki Ageng ticks remain silently continuing. However, the art of reog itself is still allowed to be stage because the show has become popular among the public, but the story has a new channel where the added characters from the folklore yaitu klono sewandono, ponorogo goddess songgolangit, and sri genthayu. Official versions reog ponorogo storyline now is the story of the king of ponorogo kingdom who intend applying of daughter from kediri, the goddes ragil kuning, but on the way he is intercepted by the singobarong king of kediri. 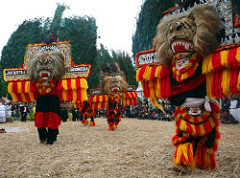 The forces of king singo barong consist of a peacock and a lion, while the kingdom of king kelono and his deputy ponorogo servant anom, escorted by the warok(men dressed black-black in their dance), and the warok has a black science. The whole dance is a war dance between the kingdom of kediri and the kingdom of ponorogo, and pitted black between the two sciences, the dancers in a state of “possession”as the performed their dance. Up to now, ponorogo society only follow what is the legacy of their anchertors as very rich cultural heritage. Reog is the art human creations which is formed by the existing beliefs of the existence of hereditary and conserved. The ceremonies used the term that is not easy for the layman to fulfill them, in the absence of a clear lineage. They embraced the parental lineage and customary law which applies. 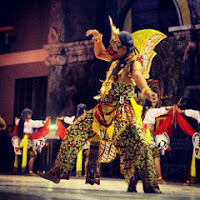 0 Response to "The Legend of Reog Ponorogo"